We offer FREE next day delivery so you can stay on schedule! We set the standard for customer service in our industry! Since 1975, we have been focused on one thing – anticipating and meeting your needs 100% of the time. We are a local, family owned business that has been serving the Middle Tennessee region since 1975 and are proud to provide a complete offering of maintenance, janitorial and safety supplies to serve your needs. 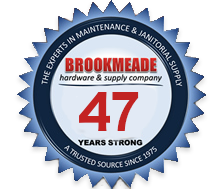 We provide “one-stop-shopping” for the very best in maintenance, repair, janitorial and safety supplies and equipment. Our products are selected from the most highly regarded companies in the nation and we sell them at very competitive prices. We are second to none in our in-depth knowledge of our products and their application. Our sales representatives are always ready to partner with you to analyze your toughest problems to ensure you have the right product for the right job at the lowest possible cost! Having trouble finding an unusual or hard to find item? Give us a call, special orders are always welcome. No waiting for callbacks and no automated menu with calling us. Our customer service consultants are always there to take your order directly, solve your problem promptly, or answer questions. Through our affliation with national vendors and buying groups we are able to offer the best in competitive pricing!